14/20 GF 8.5x15.7mm 24 gauge Tiny Light Earwire, 1.4mm Open Ring ID. 10pc pack is the equivalent of 5 pairs. This Little Light Of Mine! 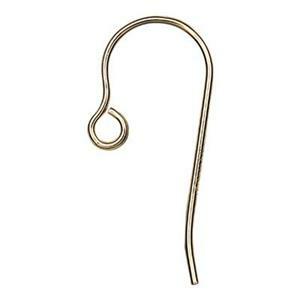 Our GF6004 – 14/20 Yellow Gold-Filled 24 Gauge Tiny Light Earwires. For those adults that prefer a smaller, thinner Lighter gauge ear wire. These are small so we highly recommend using a stopper backing like our E28 to prevent the earwire from slipping out of the piercing. Select a lightweight Gold-Filled Charm to let that Little Light of Yours Shine!